ALDAN (the wave). 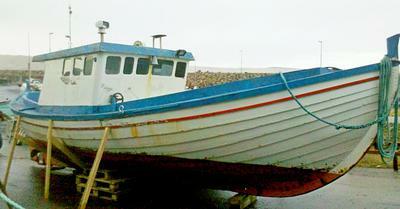 Restoring a Faroese fishing boat. I am restoring a Faroese fishing boat, which I got from my brother. The boat name is (ALDAN) in English it means the wave. The engine is a Volvo Penta, with 110 HP. I am going to build a bigger wheel house, so I can take the family on the Regatta trips, that are held here in the Faroe Islands each year. It is going to take me about one and a half years to restore the boat, because I am not at home all the time, because I am out to sea big time of the year, with the coast guard. Comments for ALDAN (the wave). Restoring a Faroese fishing boat. Take the house work off, rent it out as a prop for viking series, its got the lines. Are they a common boat?